At the Region is an ongoing feature that discusses the state-by-state training, certification and employment requirements of first responder departments across the nation. 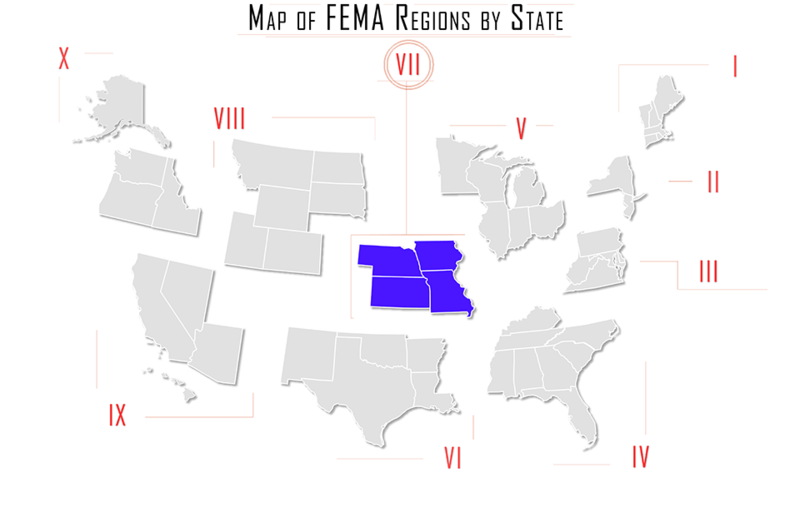 In this issue, At the Region looks at Firefighter requirements in FEMA Region VII: Iowa, Kansas, Missouri, Nebraska. The minimum standards for Iowa firefighters are found in the Iowa Administrative Code: 661—251.101(100B) Minimum training standard. On or after July 1, 2010, any member of a fire department shall have completed the training requirements identified in the job performance requirements for the fire fighter I classification in NFPA 1001, Standard for Fire Fighter Professional Qualifications, 2002 edition, chapter 5, prior to the member’s engaging in structural fire fighting. In addition to the minimum training standards, all fire department members must participate in at least 24 hours of CE a year. 661—251.103(100B) Continuing training. A. Candidate must complete the appropriate application and attach supporting documentation. B. Certificates must clearly indicate IFSAC or NBFSPQ Accreditation for the level of certification. C. Provide the Division with written verification from the non-Missouri certifying authority that the applicant’s certification is current, valid and in good standing. E. Applicant must meet the general requirements for certification as outlined in the appropriate certification booklet. The Missouri Division of Fire Safety Training Division will review and verify all documentation. Once documentation has been reviewed and verified to meet the certification criteria, the candidate will be issued reciprocity. If documentation does not meet the certification requirements, the candidate will be denied reciprocity. The candidate would then be required to complete an approved training program and meet all certification requirements including, but not limited to, passing written and practical skills certification exams. Minimum age for certification is 18. Reciprocity from the Training Division with other entities bearing certification status to the International Fire Service Accreditation Congress or to the National Board on Fire Service Professional Qualifications is established as follows. Candidates applying for reciprocity to any available level in Nebraska shall be granted a certificate of certification recognition after following the procedures for a Nebraska Certificate of Reciprocity. The candidate, if requesting that his/her certificate of certification from another certifying entity be recognized within the State of Nebraska, shall complete the ‘Request for Certificate of Reciprocity’ form on the Training Division website at www.nebraskasfmtd.org under ‘Certification’, and shall submit a paper copy of the certification certificate to the Training Division along with the fee. See ‘Fees’ section for examination costs. Upon verification of the certificate and the respective edition of the standard and level applying for, the Training Division may issue a Nebraska Certificate of Reciprocity to the individual for purposes of stating the following: The State of Nebraska and the Training Division recognize “stated individual” as having been certified by another entity by a program recognized by either the NBFSPQ or by IFSAC. The Training Division may issue a Certificate of Reciprocity for the level of the standard and corresponding edition for the original certificate of certification from the other entity. The Training Division will not issue a Certificate of Reciprocity for certification for a certificate of equivalency or any other grand fathering process acceptable to any other entity. The Training Division will not issue a Certificate of Reciprocity for a certificate and upgrade the candidate to the current edition of a standard recognized by the State of Nebraska, but will only issue to the level and edition of the original certificate. To encourage more local volunteer firefighters in the state of Nebraska, the Nebraska State Volunteer Firefighters Association (NSVFA) administers a tuition assistance program for eligible first responders. Please visit http://www.volunteerfirefighter.org/ne/strive.php for more information.